Poached, scrambled, boiled or fried? You are here: Home / Domesticity / Poached, scrambled, boiled or fried? 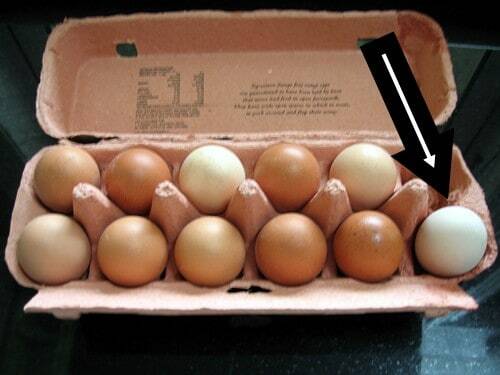 Our hen’s first egg sat pride of place in the last box of eggs I expect to buy from the supermarket. Just in case you can’t recognise it I’m pointing it out for you! 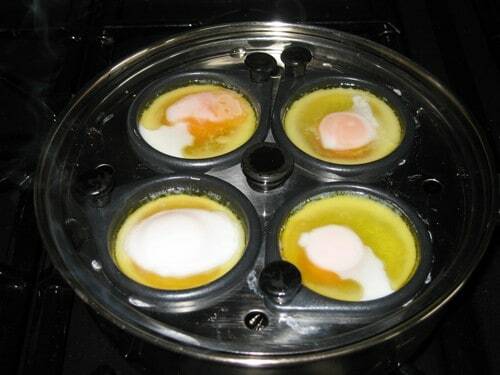 It was a tough decision whether to poach, scramble, boil or fry our first egg. I got the privilege of cooking and eating the first one. A reward for all those mornings and evenings I’ve ventured out in the cold and wind to tend to our chooks. What a gentleman my husband is! In the end I decided on poached. I have to say that I think you can tell which one it is without me pointing this one out. Yes, guessed it. Bottom left. The one with the perfectly formed yolk and white. The other eggs are clearly not as fresh. All I can say it was a delight to eat. Tasty and you could definitely tell the difference. I’m looking forward to abandoning my egg buying now and sticking to the fresh supply from our own garden. I now need to find me a suitably beautiful egg rack to keep them in so we can show them off as a work of art in our kitchen. Any suggestions of a suitable egg basket/rack/receptacle much appreciated folks! Previous Post: « Beans means……. Claudious, get yourself some chooks and change your life forever! An Eglu is what you need. Go on, look it up on google!